Calling all golfers! Amari Pattaya and Amari Hua Hin are proud to sponsor Amateur Golf Week 2016 part of Asia Golf Week — a series of golf events in destinations across Thailand and surrounding countries to highlight the great golf courses here in Asia. There are even activities, tours and spa treatments planned for accompanying non-golfers, so be sure to visit the websites to learn more about both events. What: This 7-day event will showcase the best golf courses in Pattaya, including all three course at Siam Country Club, which will also be the venues of the LPGA and Asian Tour in 2016, and Laem Chabang Country Club, designed by Jack Nicklaus and widely hailed as the best course layout in Pattaya and for its unique usage of the land’s mixed terrain of mountains, lakes and river valleys. The tournament will be played over four rounds and daily results will be announced with individual trophies given out each night during the social events at Amari Pattaya. See full course profiles here. For more information about Amari Pattaya Amateur Golf Week 2016, please visit the website. What: This 7-day event will showcase the best golf courses in Hua Hin, including Black Mountain Golf Club, voted one of the top 100 courses in the world outside the USA and Banyan Golf Club, which was voted best new course in Asia in 2009 by Asia Golf Monthly. 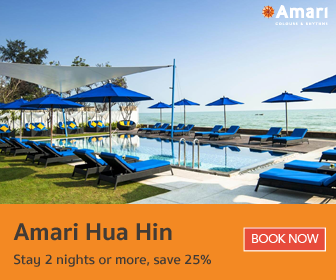 The tournament will be played over four rounds and daily results will be announced with individual trophies given out each night during the social events at Amari Hua Hin. For more information about Amari Hua Hin Amateur Golf Week 2016, please visit the website.